It's important that you're aware of how best to prepare your goods prior to transit. All freight presented must be securely attached to a good quality pallet. 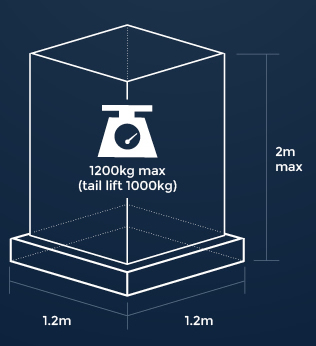 The minimum transhipment process is eight lifts commencing at your collection point. It's therefore imperative to use good quality four-way pallets to negate any problems through the collection, transhipment and delivery process. Goods should be banded, heat or at least shrink wrapped to the pallet making sure that there are no items overhanging. All freight should be wrapped to protect it from inclement weather during the local collection and delivery process. In the case of high value goods, these should be black shrinkwrapped and security (tape) sealed. The Pallet-Track network does not carry hazardous goods. We also have a maximum standard pallet weight of 1,200 kilos with a Tail Lift maximum being set at 1,000 kilo. The standard pallet size and dimensions are as illustrated and must be adhered to.